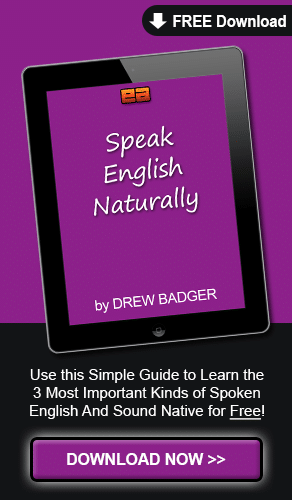 Learn how to have deep English conversations with this Advanced English Phrases video lesson! 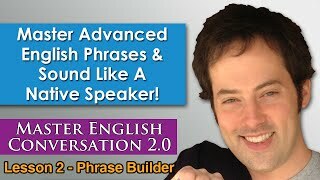 In this sample Master English Conversation 2.0 Phrase Builder video lesson, you’ll learn lots of great phrases, that will help you express yourself in more detail, and in more complex ways, to have deep English conversations. Enjoy this Advanced English Phrases lesson video about deep English conversations, and let us know what you think in the comments! Well, hello and welcome to this month’s Phrase Builder and pronunciation practice lesson. It is a pleasure to have you with me again today. This month, our topic for the month is deep conversations. kind of, uh, you know, basic, everyday conversations about sports or the weather or how’s the family, things like that. or deep conversations, uh, where you really get to talk about the things that you’re passionate about. but for right now, we’ll just cover a few of the different words and phrases that appear in the conversation itself. So, we’ll be talking about two different things. First, we have the short, one-word and, you know, very, kind of, very quick and easy phrases that you can use, and we’ll also talk about some of the longer phrases and expressions. The first one that you’ll hear is dapper. Now, Shannon, uh, he’s an Australian guy, so he would pronounce it dapper. uh, with that “ah” sound, dapper. And I have the stronger “er” sound. American speakers, like myself, so you can really get that “r” sound. Now, what dapper means is handsome. It’s, kind of, neat and sharp. And right now I don’t look very dapper. but, you know, I’m just regularly, you know, wearing a T-shirt and it’s not particularly handsome or, you know, anything fancy like that. But, if I have a nice suit, you can say I was looking dapper. Now, this is just a great phrase, a great word you can use. and people will be surprised and impressed by how you sound. Half-decent is a great way of some, is, kind of, saying something that’s, eh, it’s okay. It’s, it’s not so great. The restaurant over there it’s, eh, it’s half-decent. Watch how I’m using the expression, not just the words I’m using, but the way I’m saying it. So, decent just, kind of, means, uh, it’s kind of a more, uh, intelligent way of saying, like, okay, like 50 percent. But then, half-decent is a little bit lower than that. Next, we were talking about clothing and, especially, loud clothing. Now, loud clothing is like a bright red shirt with pictures of penguins fighting dragons and things like that that you’ll see, like lots of sparkles. This is called loud clothing, or you can describe someone’s clothing as being loud. you can just call it loud. Next, to pull off something. Now, this is a really fantastic phrasal verb that I highly recommend. And what it means is to succeed at something. So, usually, let’s say I’m, uh, I’m trying to, uh, I’m trying to pull off, like, a crime or something like that. uh, and I’m going to pull off a robbery. if I succeed, then I get what I want. So, I can pull it off. In the fashion sense, you can talk about someone being able to pull off a certain kind of clothing. Now, maybe a beautiful woman could wear, uh, like, a thong, you know, those like really tiny bathing suits, but I could not pull off a thong. I couldn’t pull off a thong. If I was wearing a thong walking around at the beach, I think people would think that was pretty funny. to succeed at being able to do something. Next, to be out there. To be out there means to be crazy or wild or different from everyone else. and a cane and big glasses, that guy is out there. So, he’s different from everyone else. but usually we talk about something being out there is just, kind of, different than normal. So, we have a kind of normal space and then outside of that. So, describing someone as being out there. we teach them things that, uh, yes, it’s, uh, it’s good, or no, it’s bad. And we usually call this black or white thinking. And for kind of teaching children it’s a bit easier to do. But as they get older they learn that there are gray areas. and maybe I think she does, maybe I think she doesn’t. But if I think she does, I might tell a white lie. you know, kind of hurtful to someone. So, this is a white lie. Now, I might tell a white lie because this is a gray area. Now, are lies a good thing or are lies a bad thing? Well, there’s a gray area. Let’s say I’m talking about something, I’m talking about, uh, my pet iguana. I bought it in Hawaii. So, a side note, it’s literally like a note, but it’s a piece of information on the side of something else. A repercussion is an unintended consequence, or something bad that happens when you are trying to do something else. Let’s say you have two parents that are arguing with each other. Uh, they are having a really bad fight and maybe they just think, uh, they are the only two in the conversation. But, in the next room, one of their children is listening to that. So, the repercussion of them arguing is that the child feels bad. So, this is a, uh, an unintended consequence. And now we’ll go over some of the longer phrases that appear in the conversation. I have a penchant for expensive cars. or you really like something, or you have a habit for something. So, it’s just something you have a kind of, natural liking for something. Next, damned if you do, damned if you don’t. To be damned means to be cursed by something, or to have a problem or something happen to you. uh, how Shannon was dealing with his wife. uh, and then his wife told him to wear, kind of, a different kind. But he said that it’s really difficult to find a, kind of, middle area where it’s okay for his wife. Because if he wears what she wants, then she says it’s boring. But if he wears what he wants, then she says, “Well, that’s, that’s out there. So, if I do something there will be a problem. If I don’t do something, there will also be a problem. Next, a little bit goes a long way. And what that means is that if you have even just a little bit of something, it will solve the problem. To go a long way means to solve the problem in this way. helping you recover from, you know, a sickness or the flu or a sore throat. So, a little bit goes a long way. or a little bit is very powerful, so you don’t have to use very much of it. Next, to do your part. To do your part means to help in some way. I’m doing my part for the environment. I’m doing my part for the environment by cleaning up all the trash in my neighborhood. Now, it can be for an organization or for a person or a group of people. uh, cause or some group of people, something like that. Next, to do right by something. To do right by something. uh, to be positive for that thing. it sounds kind of weird to non-native speakers. So, to do right by the planet, you shouldn’t throw your trash on the ground. Do right by the planet. So, to be helpful, uh, and to do something positive and beneficial. Next, on both sides of the issue, or on both sides of an issue. or look at something from one perspective or another perspective. So, the issue or the problem of something, or the question of something, usually it has two different sides. So, you can look at it from this side of the issue or this side of the issue. So, I’m on this side of the issue. He’s on that side of the issue. And we are thinking about both sides of the issue. So, an issue might be, uh, should children be able to smoke, let’s say. Should little kids be able to smoke? So, we have people on both sides of the issue. And, finally, the tip of the iceberg. The tip of something is the very top edge, or the last little piece of it. This is the tip of my finger. The tip of my finger, or the tip of one of my hairs. The tip, just the end of it. An iceberg is one of those big pieces of ice floating out in the water. and the iceberg will look like this. It will have a really big part under water and just a small part on top of the water up here. and you can only see the tip of the iceberg. Even though the iceberg is very big, you can just see the tip of it. This is a really common expression. I highly recommend you remember this one. remember this one in particular because it’s so useful and you’ll hear it everywhere. This problem is just the tip of the iceberg. Well, that’s it for this month. I hope you’ve enjoyed all of these phrases. Be sure to go back and review all of them. 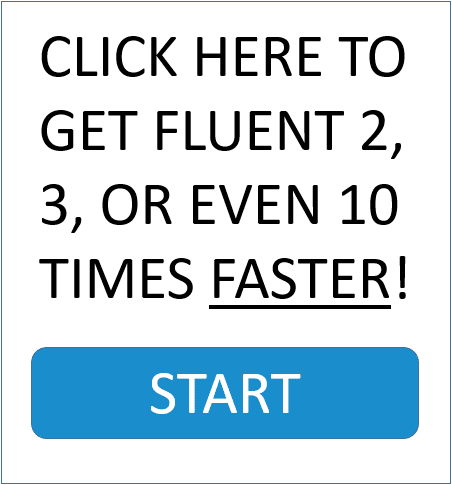 Listen to my pronunciation as I’m saying them and practice with me if you’d like to sound more like a native American speaker. And I look forward to seeing you in the next lessons this month.